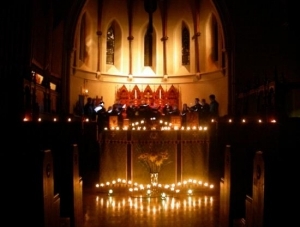 Night Song is a weekly, hour-long meditation featuring sublime choral music and transformative instrumental accompaniment in a quiet, candlelit space. The music is a unique fusion of contemplative instrumental jazz with ancient and modern chant, as well as sacred motets from the Renaissance, and is offered within the framework of the monastic office of compline. To some Night Song is experienced as a spiritual journey, letting their prayers and hopes rise with those of others as incense, the lifting up of hearts and hands as an evening sacrifice. Some simply receive a sense of comfort and strength. Others use the music to transport and transform, to escape for moments of peace and clarity. While Christian in nature, Night Song is open to all. Simply take from it what meets your needs and what expresses your hopes and concerns for others. Night Song provides a unique opportunity to escape from the worries and challenges of the world. Come into the peaceful, quiet environment, and let the beautiful music and candlelight envelop and inspire you.